Have you ever heard the idea that systems run your business or find good people to run those systems? 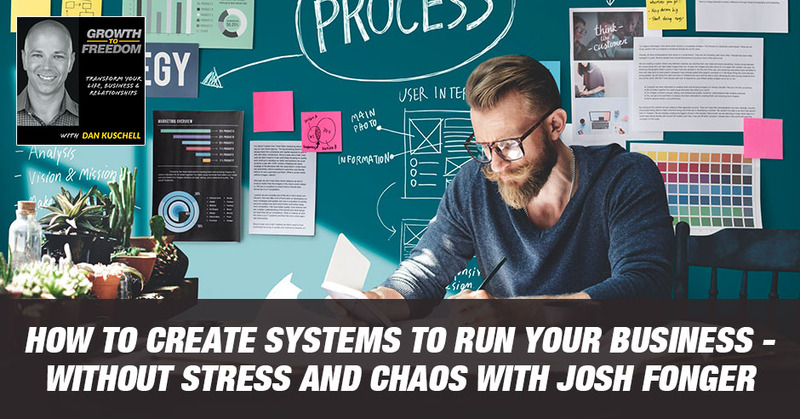 What if you had a chance to build a fool-proof system to run, scale and grow your business so that it would be less stressful? You could do more of the things you want to do. You could work more on your business instead of in your business. Do you think that’s too good to be true? We have got an expert that’s uniquely qualified to be able to share with you how to be able to do that. His name is Josh Fonger. He’s an international business consultant, coach, and speaker who recognizes the authority in Business Performance Architecture. In the last several years his firm, Work The System, has attracted over a million business owners from over 50 countries. 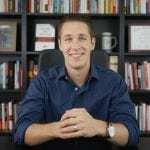 He’s personally consulted over 600 business owners from startups to over $500 million a year from around the world. His specialty is helping businesses develop processes so you can scale. Josh, welcome to the show. I’m glad to be here. Thanks, Dan. I want to kick this off because our buddy, Tim, got us connected. I want to read the note he sent me when he made our introduction. 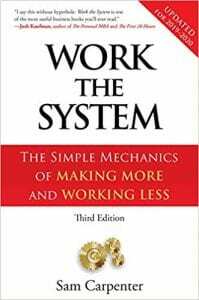 He says, “One of the best books on systematizing I ever read is called Work The System. I’d say it blows away The E-Myth. I was impressed with the book that I immediately enrolled in their three-month program led by Josh Fonger. That course was one of the foundational pieces in how I’ve rolled out my current companies. I was speaking with Josh and he’s expressed interest.” Tim thinks the world of you, what you do and how you do what you do. Tim is one of the best systems experts I know as well. Considering he says you are a big part of how he got his start is saying a lot to me. You’ve worked with over 600 businesses directly. You had over a million people you have attracted through all the different resources and work that you have done. Why are you doing what you’re doing now? I was trying to start my own company years ago and ran into Sam Carpenter, author of Work The System. I met him and I was talking about the company I wanted to scale and grow. He said, “It’s a terrible idea, Josh, because you’re going to be herding cats. It’s going to be a disaster. You’ve got a divorce.” I didn’t understand what he was talking about until I went a little bit deeper with him. He and I started working together and I came to realize the profound nature of seeing your business as the separate systems getting above it and looking down on it. Once I started working with him about seven, eight years ago, dissecting companies from around the world in all different industries. I realized that if you break the company down into the simple mechanics, you can free up an onerous time and you can scale it. That’s how it started is when I met Sam Carpenter. You’ve had a lot of different types of businesses you’ve been involved in. Let’s speak to an area where you haven’t had success. You’ve been on this journey of building and growing companies or maybe your own or working with clients. What’s been your biggest failure, your biggest mistake on your journey? What did you learn from it that our audience can learn from it too? The first thing I learned and certainly my clients learned too is that you can’t make things more complex than they need to be. When we first started off, we made business complex when we were helping companies. We would tailor each of our offerings to the specific clients we had. All of our clients, in the beginning, were large consulting clients. It wasn’t until we had about twenty clients that we realized we should probably systemize the way we trained, systemize the way we consulted and systemize the way we coached. It went from working with large companies to smaller to where we are now where the majority of the clients we work with are smaller companies. We’ve scaled a system to help them grow. It started off with one-off projects that were large, moving down to a systematic scalable approach to help the most people. That probably was our biggest problem in the beginning is not going scalable but instead being customizable. What is it about the entrepreneur’s DNA that wants to make it complicated and messy? Why do they want to do that? It’s because they see all the problems and entrepreneurs I work with and you as well, they are usually higher IQ. They usually can solve complex problems. They see all ten problems they want to solve all ten problems, instead of building a way to solve one or two of those problems in a scalable fashion. When they figure out a way to solve all ten problems, they try to pass it on and they can’t pass it on because no one else can solve the ten problems simultaneously in the same nuanced way. That is the biggest challenge I have with the companies I work with is because they’ve come up with a complex way to solve a problem with a product or service. They wonder why they can’t delegate it down in a scalable way. I try to put barriers up in terms of what they should be doing and systemize it with small pieces. Once the small pieces are made, it’s easier to scale. It comes down to entrepreneurs being at a higher level than the average person and therefore, they want to do it all. Do it all and more and more of all, and that isn’t even enough. I keep adding to it. When I start building a little bit of momentum, I get distracted by a new project. It’s a great skill to have because entrepreneurs have to be the ones who are trying out new ideas who are doing business development that is innovating. They need to realize that it is different than business building. The innovation, the development, the ideas, that’s one piece. Everyone beneath you who are helping you scale can’t be involved in all of that nonstop or they get whipsawed. You run in circles and you stay a novice company for ten years and never move on to higher levels of excellence. What’s a piece of advice would you give to a creative entrepreneur, that visionary leader, that innovator, that business development? They come up with more new ideas by 7:00 AM in most mornings than most people do in a year. They never have enough of them. They’re frustrated about the fact their team can’t keep up with them. They don’t understand like, “Why haven’t you implemented my ideas?” and they haven’t even gotten to three ideas and they’ve got 4,000 of them. 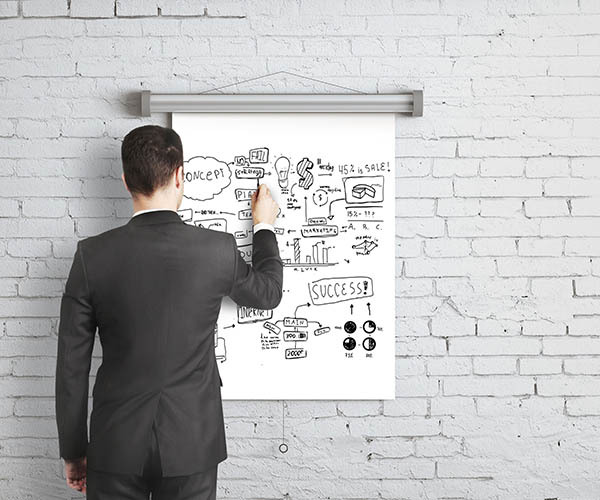 What advice would you give to the owner in setting up their company, a lean company? Let’s call it less than twenty people, maybe less than ten, maybe even to put it in context. Anybody that’s even a brand-new startup, less than five, can have some peace of mind of a way, a tool, a resource, a way to think about navigating these great ideas or some call them crazy ideas? The best piece of advice that I have for companies that are growing is they need to have what we call a replacement or they’d have an operations manager or a right-hand man or woman. Whatever you want to call them, but somebody who is operationally-focused, who will stay within the lines, which will do the same thing day after day and keep the train running. They need someone like that. To pretend they’re going to all of a sudden build the skill sets to do that and be happy there is not a reality. They need to find that person. A lot of companies I work with I’ll bring on and I call a procedure project manager and operations manager to help them. That person keeps the business running and they can then do their innovation and their ideas off to the side, and then on a weekly basis or monthly basis, feed in the ones that are appropriate. You can’t incubate ideas within a live business and have the cashflow smooth and have the system smooth. It’s important for owners to take a few hours and document exactly what they want the business to achieve, whatever business they’re in. If they have new ideas that are off tangent, they can think about those in terms of a different business or a different vision for a different entity. In the case of my business partner, Sam Carpenter, he has a software company and it’s a nonprofit. He does politics. He has the call center and the training company. They’re all separate entities. He’s able to take his ideas and place them into the right entity with the right manager to run them, instead of trying to mix them all together and have a mess. All of this makes sense. There’s the side of it, the entrepreneur, the ones writing the checks. I’ll speak to me rather than everybody else. In my early years of business, I used to take people on the rollercoaster of all these crazy ideas. It creates a lot of whiplashes and it creates a lot of carnage in your business frankly because people can’t keep up with that. It’s almost like a civil mentality, Jekyll and Hyde. There is a speed of implementation that an entrepreneur wants and desires, and when they don’t get it they get upset and they get frustrated. I hear this pretty regularly in different ways too. We were talking about this idea of the creative genius. They incubate ideas more by 7:00 AM most mornings than most people do in a year. There’s this frustration that sets in if they can’t share it with everybody, there’s a fear of it’s going to miss out. I’ll speak to myself and how I’ve operated in the past. I have this right-hand operations person that I’d share these ideas. If I didn’t feel they were being taken seriously if someone was running with them, I’d go pull two other people out of another division of my company and I’d share the ideas with them to get them to run with it. I’m sure you’ve never heard that before. For the creative genius, how do you tame that a bit to allow the genius to be innovative, creative and growth-oriented, yet still not take your team on the rollercoaster? We institute structure and owners don’t always love the structure, but they love the results of the structure. What we do is we equip them with what we call a strategic objective where they write down what they want out of business. Sam wrote this strategy for his team. We write it for all of our companies. It’s great for the team, but even better it’s great for the owner because it forces the owner to put all of their ideas through their own strategy. They’ll put their idea through their strategy and they’ll know it’s off track or it doesn’t quite fit. It helps them clarify their own ideas because they want the ideas. If they don’t fit within that strategy, then they end up taking the company the wrong course. The operations manager underneath them can also hold them accountable to that, and so can the rest of the staff. We try to set up that clear vision for either each department in a large company or the company as a whole. That clarifies all decision making. We want the actual ideas to come. We want to have a place to put them. My most creative owners they’ll always be drafting ideas, they’ll always be putting idea somewhere, but they don’t always share every idea because it doesn’t fit with the strategy. You can’t make things more complex than they need to be. They surveyed the customers and found out the biggest issue the customers had is they wanted there to be some meat dishes and they wanted the menu to not change much. Those were the two cornerstones of the strategy beforehand was no meat and change the menu every week. Learning from their audience allowed them to take their current strategy, adjust their menu, and then they were able to grow at a new location. The strategy helps you get a red light and green light ideas. 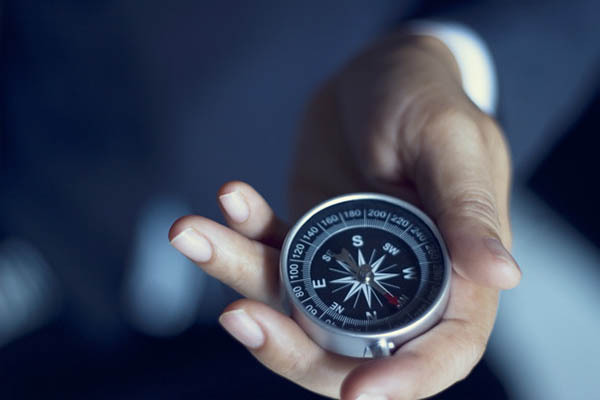 As new information comes, as innovation comes from the outside or from the owner, you can put it against the strategy and then decide, “Are we going to change course a few degrees? Is that still a bad idea?” It gives you that backbone. That backbone is important. You’re part of a group called Work The System. You’ve had over a million people take advantage of all the different resources you make available. Talk about what is the Work The System method so people have a deeper understanding of the context of where we’re heading with this conversation. Certainly, people can read about my business partner, Sam Carpenter’s story and that’s what Work The System the book is about and that’s what the method is based on. Essentially, he was working 100-hour work weeks living in his business. Literally, he would sleep there at night and live there. He had this epiphany and he calls it getting the systems mindset. He had a dream and in the dream, he saw his business laid out on a table and all the separate pieces of his business were there. The hypothesis in the dream was, “I wonder if I make each piece of my business perfect, and then put them back together if I’d have a perfect business?” That’s what he went about doing is he perfected each piece of his business over the years and built systems to do that. He put it back together and he was able to go from a 100-hour work week down to zero hours a week now. When he wrote the book, it was a two-hour work week. He doesn’t do any work anymore. In terms of growth, his income went up twenty times. He wrote the book writing about the method. We take that method and apply it to companies. It’s very clear. You get the systems mindset. Getting outside and suddenly elevated. You get a clear strategy. You get principles for making decisions. You build systems and the various elements of your business to make it scale. It’s a simple method and we take that framework to help companies overcome their own challenges of working too much with too little bottom line. One of the things that you guys talk about in your work is the idea of, “Is your strategy scalable?” Speak to that a little bit. It could be a lot of reasons why your strategy is not scalable. It could be because it’s too complex. It could be because it’s too expensive. It could be because it’s too localized. It could be a whole host of issues. We’re more a coaching business than a training business. I analyze each strategy one by one like I had a company fly into Phoenix where we analyzed their strategy. They’re a marketing company. They had unique skills and unique areas for a unique subset of the market, and that’s what they’re going to scale. They couldn’t scale being marketers to everybody, even though they’re getting clients from all different places. They had to figure out what is their unique edge? In their case, they had a unique edge and a great relationship with the owner of a company that had massive authority. Where they could get about 6,000 clients if they decided to stick within a lane, as opposed to going all over the place which is what they were doing before. It was the strategy of being everything to everybody and saying, “In your case and your situation based on your team, take this lane, that’s scalable.” That’s what built their strategy on. It’s a little bit different with each company. Some of the time we talked about the difference between strategy and tactics. Tactics come and go. They’re not timeless, they’re timely. Whereas the strategy is timeless, it’s proven. It’s like gravity, what goes up must come down. Speak to your framework around looking at strategy versus tactics and the importance of them in building the bigger picture of your business. I would say in terms of the strategic objective, it is the direction and the strategy you want to keep for many years. The Work The System method is a strategy for scaling a business. The tactics do change. In the strategy itself, we’ll say, “We will adopt the newest tactics. We will adopt a higher level of technology. We’re going to be innovating continuously.” That’s a strategy which requires that the tactics change. We’re in the podcast. This is a newer industry. The tactics are going to change all the time. If you are in a traditional business like you have a restaurant, the tactics are going to stay similar. When I document a business, I document it differently based on the amount of innovation that’s going to be required to stay on top. If it’s going to stay consistently the same as in a restaurant, the hostess or host is going to greet someone and they’re going to seat them. They’re going to wait for the table. The recipes for success you can dial in and the tactics you use can be very systematic and stable. Whereas if you’re going to be in an innovative environment like you’re starting a podcast, you’d have to be willing to change and be nimble. The tactics, without documenting them, you lose the ability to scale. That’s a big part of what we do. We don’t necessarily develop the tactics for you, but we put them into a framework so that the tactics don’t stay in your head or your team’s head. They have the ability to be reviewed by everybody and therefore improved and innovated on. They have the ability to scale and be delegated. It’s almost like coming up with that X factor or you call it the ultimate edge. Some people call it your unique positioning, and there are many terms that you can think of. What is it that makes you unique that someone can’t get that the exact same way anywhere else? What would that give you as a differentiator? What would that give you to position you as the authority in your marketplace, not a commodity? I want to have you take us home here. What are one to three breakthrough strategies you’ve seen with your clients? I don’t know if they’d be new innovations because it sounds sometimes you got to slow the game down to allow you to grow in the game. What are one to three big breakthroughs or transformations either you’ve experienced personally in the last several months or maybe your clients have experienced that our audience could take home with them and apply and implement? These would probably the ones I think of now, I don’t know if they’re the most powerful. One is the clients that are the least efficient that I work with are usually the nicest clients. If you’re finding that you are the victim of your own circumstances and your own realities, it could be that you are allowing other people’s priorities, burdens and complexities come into your life. You’re trying to solve these problems instead of setting clear filters for how you receive information and then clear outcomes of what you’re going to deliver. If that’s unclear, then the owners I work with are usually the most dysfunctional. It’s a big thing. Once you have total clarity, then the friction goes away. The second thing would be alignment. It’s a big one people miss out on is the efficiencies of alignment. If the strategy is misaligned with what your focus is, which is misaligned with what your manager’s focus is, which is misaligned with your client. I’m talking a few degrees, which is misaligned with your service, which is misaligned with their customer support, which is misaligned with your technology. That would be bad but usually, they’re each off by a few degrees, and each of those friction points is costing you lots of money. People don’t realize that and they need to get clarity. That’s why we believe in the power of writing things down. Once you have total clarity, then the friction goes away, the coordination goes away or the customization goes away, then it’s smooth the whole way through. That’s a big opportunity. The last one, I’ve done this at some communication workshops to systemize the communication, is that owners don’t realize the amount of money they’re wasting their company by communicating with their team. What I mean by that is communicating without any clear structure or system behind it. Every time you email, call, text, voicemail anybody on your team, no matter what they’re going to stop whatever they’re doing. They’ll listen to it, react and try to solve that problem for you because you’re the one paying the paychecks. You are destroying the deep work and the productivity of your team all the time throughout the day every time you communicate. 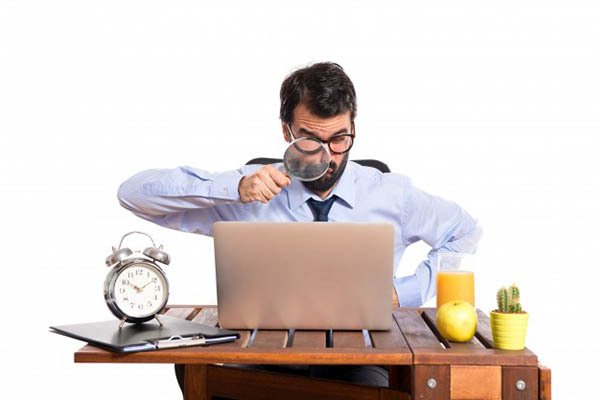 You need to come up with a system to deliver that information in ways that they know how to digest it, such as text message means, “I need a response right away.” If it comes through a Slack channel, then what is the appropriate time frame? An email, what is the appropriate time frame? You’re not destroying the productivity of your team and instead of allowing them to get their deep work done because that’s costing you a lot of money. As you were going through these three things, I’ve personally fit into all these categories in different ways over time and I’m still working on them as an entrepreneur, business owner and running our teams too. What have you seen as far as the outcomes with some of your clients when they do get this right? What’s the shift that happens for them to free themselves up? What’s a common experience? The first thing that happens especially with clients I’m flying out to regularly is that I’ll fly out there and immediately notice the stress level down. My coaching clients too, I’ll do a survey a few weeks into the program that I do with them and that’s the first thing. It’s not profit first. It’s the stress going down. It’s the calmness knowing the systems are going to be the place that stores all of the best practices and the best ways to do everything. People aren’t going to be going to me anymore. The fires will go down. The emergencies will go down. That’s ultimately what we do is we build this separate brain. Instead of everyone going to you, they go to this portal, the brain. That’s where all of the best ways to do every single aspect of your company reside. That’s the go-to source, the hub, instead of people’s brains which then allows people to do their deep work. Stress is the first thing. I love watching that stress level going down. I was working with this commercial appraiser and helping him grow his company. That was one of the first things that I noticed. Three months in he said, “Josh, what do I do now? They don’t need me at the office anymore. The company keeps growing. Now, what?” He started road bike riding and joined a band at his church. Another few months went by and he said, “I think I’m going to go back to work now and then open up new locations.” He thought he had to be at the center. Once he realized that if he built the machine, the machine could be the center. He never realized the freedom he could have. When you say the machine, is that the business brain? That essentially you’re unpacking your superpowers so that you can leverage yourself to free up to allow people to go to that machine to leverage those resources. Is that what you mean? Exactly. All employees are going to align every decision around what’s going to make the owner happy. Instead of you being the North arrow for what makes the company happy, you write the strategy and the principles down and you say, “That’s what will make me happy. I’m going to go leave now. Follow the strategy and the principles.” Every decision, including the owners, align by that. You’re not beholden to the owner’s emotional ups and downs. That’s the true North. Everyone aligns by that, which gives great incredible efficiency and clarity. The owner says, “I don’t need to be here to set direction every single moment because these core documents are setting direction,” and then they can innovate off to the side. You’re getting a glance at Josh and his wisdom and his superpowers. If people want to go deeper with you and they want to learn how they can connect with you or get into some of your work, how can they reach you? The simple way is to go to WorkTheSystem.com. There they can download the book for free. They can get the audiobook. We’ve got a podcast, webinars. There are a ton of free resources because that’s why we’re set up to help entrepreneurs grow their business with systems so they can make more, work less. If they want to go deeper, we’ve got group coaching, one-on-one coaching, consulting and events. Everything is at WorkTheSystem.com. I want to encourage you if you resonate with what Josh has been sharing with you. First of all, imagine what it would be like if you could put yourself in a place where you had the machine brain running your business instead of your brain as the owner. Allowing you to be more of the creative genius you are or spend more time with your family or do more of the things that matter, mean, and have a purpose for you and to you. What would that be worth? If that excites you, then go check out their website. Check out what Josh is up to. See how they can help you whether it’s their books, their audio programs, their consulting, their events and a whole lot more. I know these guys can help you. My friend, Tim, is a tough critic. He was impressed with the book, he immediately enrolled in their three-month program and it set the stage for his business. I know for me what it’s meant becoming more system-oriented and I’m not perfect at it. I’ve learned to focus on this part. When my business was a lot more chaotic and we had over 100 employees, we put systems in place. We grew it to 200 employees. We grew it as an asset then it gave me the great gift and the opportunity to sell it and exit. I got to take several years off and start the process of, “What do I want to do at the next level?” I like to think we carry that forward. I know Josh can help you with what you’re doing, so go to their website. Josh, you’ve got three kids. They’re about my kids’ age. My kids are thirteen and eleven. You have a thirteen, ten and eight-year-old if I’m not mistaken. What do you think your wife would say of what it’s like living at home with a process and system genius? She would say that it gives a lot of simplicity to our life. Having a system doesn’t have to be boring. We have a weekly date night. We do a daily walk together. My kids and I pray together in the morning. We have these routines that happen every day because we know that the repetition of these routines is going to result in a good lifestyle and get us the direction we want to go. We set up all of these particular systems and I use checklists with my wife and with my kids. It seems strange but we homeschool. Every day after I eat breakfast with the kids, I write a checklist for each one of them. They know what’s expected and they know how to do it. They feel empowered. They self-teach for the most part. It gives us a lot of free time and a lot of free energy and bandwidth to do the creative stuff that we all want to do together. What it does is it gives you a whole lot of free time and also removes all distractions. I’m a big believer in you setting the course for your direction, especially with your family and your business. It’s okay what everyone else is doing because you proactively decided instead of reactively adjusted to those other surroundings. I love the fact that you brought up that you take a daily walk with your wife. My wife and I, because here in Phoenix it gets a little hot, we do walks except when it’s 120. We do walk about twice a week and find that it bonds us and connects us. What have you found in doing a walk with your wife once a day? It’s usually twice a day, but always at least once a day. It enables the chance to digest our day together and to help each other out with the struggles that we had each day, no matter what those might be. She’s my best friend. Likewise, I’m hers. We love our time together. It’s great for your health too. Tons of research about health and we exercise each day, we walk each day. That’s more natural than the sedentary lifestyles that we’ve built in America. We think it’s the big part of being healthy. You set the course for your direction. What would your wife say is the quirkiest thing about you? I have no idea what she’d say is the quirkiest thing. That’s the biggest problem we have in our market is I’m too boring of a guy. I don’t know what I do that’s quirky. Maybe it’s the fact that I give my kids checklists in the morning. That would be strange. The checklist thing speaks volumes but I don’t think that’s quirky. I’m fascinated by that going, “This is cool.” Do you have an allowance for your kids? I make them work for money. They’re working on the business. They’re starting a dog-walking business. They got the business cards. I’m training them how to sell. I’m training them how to upsell. I’m training them on how to deliver. If you live in Fountain Hills, Arizona, you might see my kids around. I want them to start companies. That’s what I did when I was younger. I started companies like window washing companies, dog walking companies, house sitting companies, lawn mowing companies. That’s what I did when was thirteen, so why just give them money? They’ve got to work for it. It’s the byproduct, as Dan Sullivan says of value creation. That’s what it’s all about. Can you think back to when you were young and what that trigger moment was for you that you were like, “I’m going to be running businesses?” Do you remember that time, that moment? What was it that inspired you to do it? I wish I could. My first business was drawing caricatures of the neighborhood kids because I was good at drawing when I was ten, eleven. People would pay me $1 per caricature. I don’t know what it was about that, but I would do that. I enjoyed making money on my own terms and doing it my own way. I believed I always had a way to do it better than being stuck within a machine. Window washing, you could have made a whole lot more money as a kid than getting paid $8 or $5 an hour, so I’ll wash windows. It was always about how to maximize dollar per hour effort. I’ve always been interested in that. If your wife were standing or sitting next to you, what would you thank her for in how she supports you to be this entrepreneur helping hundreds and thousands and ultimately millions of people that have accessed you as resources over time? The best thing my wife does for me is she has extremely high standards morally, ethically and spiritually in all ways. She never falters at all. She’s never going to compromise in any way. Having her next to me at all things allows me to not compromise. It’s easy in the world to think, “I could do this or I can adjust this way.” We’re religious, we’re Christians. She’s very much like, “This is the way and we don’t need to compromise because there’s no value in that,” especially with our kids, with our education, with our diet, and with the lifestyle. It’s because of her non-compromising attitude, it’s allowed me to stand firm in my convictions and beliefs and not have to waver knowing she’s there. Thank you for opening up about your kids. It brings the human being into the crazy world of business and creates some distinctions that people get to know that side of a person to build deeper trust. If you’re fascinated by Josh like we are, I encourage you to go check out their website. All the incredible resources, get to know him, find out how and if they can help you. If they can’t, they’ll let you know. If they can, you’ll be better as an entrepreneur for it. What are some action steps you hope our audience takes from our time? The first thing is I would want them to get outside, elevate their business and look down and decide what do they want their business to be? What do they want to achieve? The technology, the customer, make sure everything’s in alignment. The first thing is to make sure that you have a bullseye so that you can hit it, and then set that bullseye for your team and allow them to hit it. The more you can have these bullseyes set, the more your team can be enabled to have success each day. That would be the main thing is to build that alignment. Certainly, if they want more information and they want help, the free book is there at WorkTheSystem.com. I’d love them to go there and I’d love the chance to work with them. The only thing that we didn’t talk about was what does this do for your team and your employees? Most people think, “This is great for owners. They’re going to make more and work less.” The happiest employees are the ones who have this clarity and structure and know they’re winning and succeeding each day. The best way to scale is to give them that direction so that they can come up with the best ways to do each thing and innovate. Most people think this is about owners and entrepreneurs, which it is, that’s who we cater to. This framework, your employees are going to love it because they’re going to reap the benefits. Sam’s employees at his call center, the average employee in this industry makes $12 an hour. His is making $25. It’s not because he’s a super nice guy, which he is. It’s because a systematic business is going to make a great place for your team and is going to make it way more profitable than your competition. People forget that aspect of it. If you’d like to build a team in a culture where your people respect you and have the ability to double their productivity. Therefore, you have the ability to pay them more and therefore you become a competitive advantage because your competitors can’t do that, then check out WorkTheSystem.com. Go deeper with Josh’s work. Josh, it’s been a privilege to have you with us. You’ve given us and our audience a great glimpse of what you guys can do to help. Thanks, Dan. I enjoyed it. Take action with what Josh has shared with you and go to their website. Seize the day, make it a great week. We’ll see you next time on GrowthToFreedom.com. 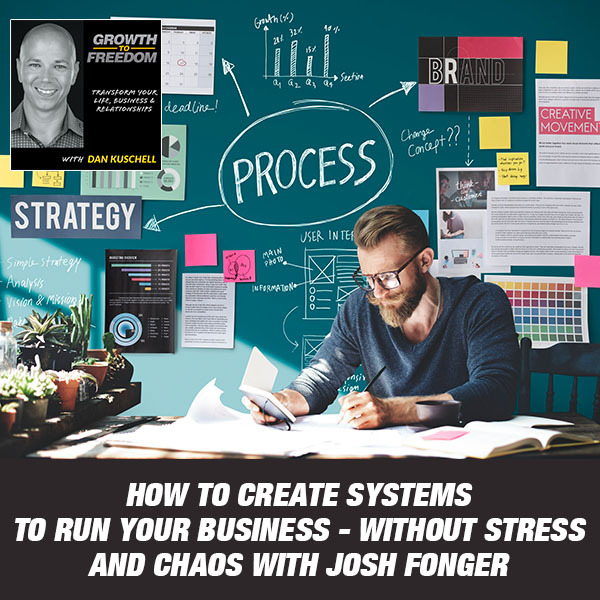 Josh Fonger is an international business consultant, coach, and speaker recognized as the authority in Business Performance Architecture. In the last 8 years his consulting firm, Work the System, has attracted over 1,000,000 business owners from over 50 countries. He has personally coached over 600 business owners, from start-ups to $500M enterprises, from around the world. Josh’s specialty is helping busy business owners develop documented processes so they can scale.